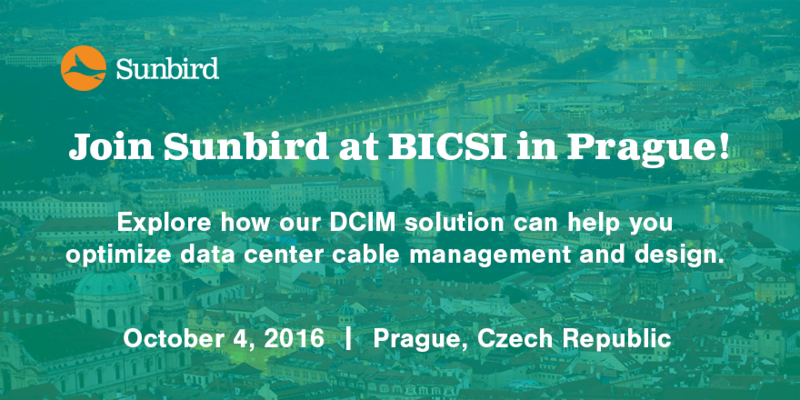 We’re thrilled to be a Silver Sponsor at the 2016 BICSI Mainland Europe Conference & Exhibition, scheduled for Tuesday, October 4, at the Corinthia Hotel in Prague in the Czech Republic. Navigation of 3D data center health maps with real-time power data. Visually build data circuits, including structured cabling, between any combination of devices, network equipment, and patch panels—all at the click of a mouse. Visualize and trace routes of power and network paths for faster and more efficient troubleshooting. At this one-day conference, you’ll have the chance to discover current and emerging trends in data center infrastructure design and management, get real-world cabling tips from DCIM experts, network with like-minded professionals, and explore how Sunbird can help you optimize the cable and power management in your data centers. Heading to the BICSI Mainland Conference and want to chat one-on-one with a DCIM expert? Sunbird representatives also will be available for individual meetings to help you explore if DCIM is right for you. Let us know if you’d like to meet.